I'll go ahead and say it right now, Egypt is the most fascinating country on Earth. And while 48 hours in Egypt isn't nearly enough, here is how you can get the most of a short weekend stay. Visiting Egypt is no doubt towards the top of every travelers list, so living close by in Dubai means that we've been eyeing a 48-hours in Egypt trip for quite awhile but it wasn't until a few weeks ago that we finally took the trip, just one week after doing 48 Hours in India. I know, we're insane. Only a 4-hour flight from Dubai, we left the UAE early on a Friday morning and were crawling through the Great Pyramids before lunchtime! It is amazing just how much you can fit into 48 hours in Egypt if you plan it right, and it comes down to two main things. First, you've got to know exactly where you want to go, and second is having someone to take you there. We've been loving TripVerse on our last few trips, which is a great app that allows us to research ahead of time, make an itinerary, add notes, routes and most importantly, download off-line maps versions of our entire trip. We also make sure to add in all the details of all of our 48-hour trips to our profile, so you can follow along if you'd like! How to get to Egypt: Check for cheap flights on Skyscanner! Where to stay in Egypt: Le Meridien Pyramids! Landing in Cairo early on Friday morning, we went directly with Mahmoud to the Pyramids in order to catch the beautiful morning light and miss the crowds. While Egypt has more tourists than it did a few years ago when I visited, it is still hurting badly for tourism and remains fairly empty. Aside from a few tour buses, the Great Pyramid Complex was pretty empty. Make sure you have enough time here to fully explore the entire area and take the time to just stand and stare at these amazing structures, some of the oldest on planet Earth - they really are spectacular. Make sure to also buy a ticket to go inside the largest pyramid and be ready for an adventure! While the innermost chamber is nothing but a large empty room, the hike up the ancient stone corridor, into the center of the pyramid is a must, and well worth the exhaustion! After exploring the pyramids, there are endless photo opportunities close by, so always be looking around you when in the area for that perfect instagram spot. Continuing on close by the pyramids is the statue of the sphinx, which is nearly as iconic as the pyramids and well worth the visit. After a full day of exploring and as the sun was beginning to set, I had Mahmoud take Anne and I out into the desert behind the pyramids by horseback, and it was stunning - the perfect place for a proposal - and thank goodness she said yes! We have done many adventurous things over the years, but getting engaged in the desert while looking at the pyramids is not one we will ever forget. And now to celebrate! There are some amazing rooftop bars in Egypt, most of which are located in hotels. And while there is a spectacular view of the pyramids from Le Meridien Pyramids, we just had to get out and explore the city to celebrate our engagement. We ended up heading to downtown Cairo, and going to the Kempinski, Intercontinental and ending up at Loft 21, which might just have the best rooftop bar and view of Cairo. After a fun night out, and only 3 hours stuck in traffic back to our hotel (not joking, Cairo traffic is mental), we hit the sack to get up early for our last day of exploring - we had so much more to see! Heading straight to Memphis, the first capital city of Egypt, we were absolutely shocked at the insane amounts of statues, carvings and artifacts at this out of the way, discrete outdoor museum. From towering statues of Ramses II, to intricate hieroglyphics carved in stone there is something for everyone, and if it doesn't fill your imagination with child-like wonder, you have no soul! Hopping back in the car with Mahmoud and Islam, we headed to Saqqara, a vast ancient burying ground, with endless tombs, beautifully painted four thousand years ago, which remain untouched today, thanks to the arid climate of the Egyptian desert. After exploring the tombs for what felt like hours, learning the stories carved into the walls from Mahmoud, who can ready hieroglyphics by the way, we were gitty as we jumped back into the car for our last stop before heading back to the airport. Mahmoud took us up to the highest point in Cairo, a neighborhood called Moqqatam, which has an unending view of Cairo. You can even see the Great Pyramids sticking out on the horizon. 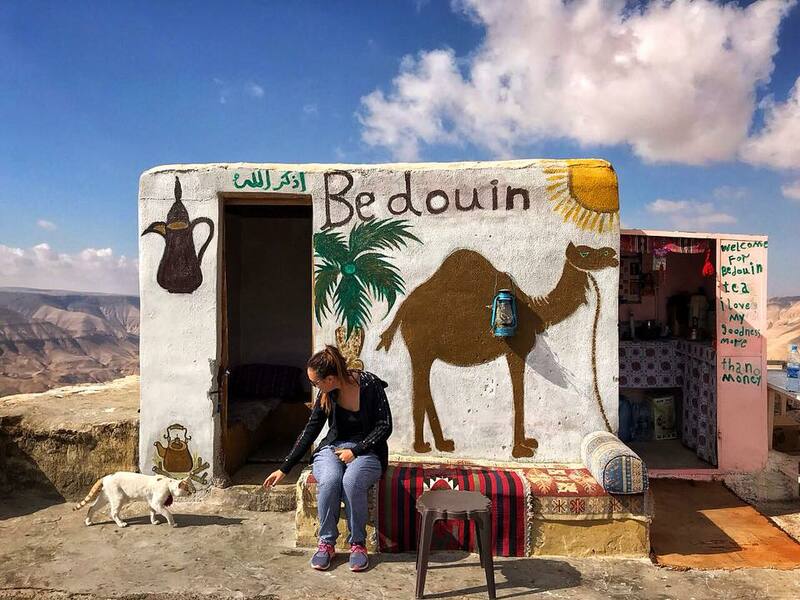 With homemade lounges and tea and shisha on offer from the locals living in the neighborhood, this has become a popular hangout place with Egyptians, especially teens, and we can easily see why - the view is just breathtaking. As we sat enjoying the view, Mahmoud surprised us with a giant cake to celebrate our engagement and as we sat there with him and Islam, we remembered why we love traveling so much. Only 48 hours earlier we had arrived in a country we knew little about and without hours we were sitting with what felt like old friends, laughing about our adventures together with beautiful memories and impressions of Egypt in our minds, which we will never forget. You're probably thinking that there are a ton of things we left off our list, huh? And you're right, we didn't even scratch the surface of what there is to see in Cairo. As Anne and I are obsessed with ancient history, especially Egypt and the Pyramids, we opted to spend a lot more time exploring the temple complex, Saqqara and Memphis, however, we've added in a ton of other sites to our TripVerse profile that you can easily fit into 48 hours in Egypt. Our 48 hours in Egypt was one of our most amazing trips, for obvious reasons, but I still stand by what I said. Egypt is the most fascinating country on Earth and we cannot wait to get back and explore it more soon - as well as laugh with Mahmoud and Islam. Most Ancient Egyptian pyramids were built as tombs for pharaohs (rulers of Ancient Egypt) and their families. To date, over 130 pyramids have been discovered in Egypt. The Pyramid of Khufu at Giza is the largest Egyptian pyramid. This incredible structure weighs as much as 16 Empire State buildings. Ancient Egyptians believed that mummification ensured the deceased a safe passage to the afterlife. The mummification process had two stages: first the embalming of the body, then the wrapping and burial of the body. Organs were stored in canopic jars, each jar representing a god.